Handcuffs with binding sigils etched into them. Colloquially referred to as "angel cuffs", these handcuffs are etched with various sigils that act as binding links to nullify the powers of angels. Despite being referred to as "angel cuffs", the spellwork eteched into them is also effective in restraining demons and reapers. They prevent the entities from using their powers, reduce their strength, prevent teleportation, and in the case of demons and angels, prevent them from vacating their vessels. Archangels have shown an immunity to the spellwork on the handcuffs, and are typically able to shrug them off. However, Bobby was able to modify the cuffs, making them capable of temporarily restraining an archangel's powers, including those of Michael. 1.11 9.23 Do You Believe in Miracles? 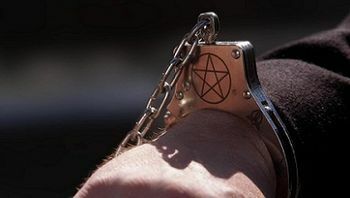 Sam and Dean use a pair of handcuffs that have been etched with various sigils to keep Crowley from smoking out of his meatsuit or teleporting away. Sam and Dean use the handcuffs on the rogue reaper Maurice, as a means to keep him tethered to the Earthly plane, and extract information from him. Crowley is once again shown to be locked up in the Bunker's dungeon when he meets the Wicked Witch of the West, who is unable to free him from his restraints, as the dungeon is warded against all supernatural beings. Crowley is still locked up in the dungeon, wearing the handcuffs. Crowley is freed from the Men of Letters dungeon to help expel Gadreel from Sam's body, but only on the condition he needs to wear the binding handcuffs. Later when he talks to Cecily, he shows her the cuffs and asks if they can be removed, to which she replies, "Not without the key." Later, Crowley also wears a collar that apparently serves the same purpose as he can't leave his meatsuit with it on. Sam and Dean use the binding handcuffs to hold Del after capturing him. After finding Crowley addicted to human blood, Sam and Dean slap the handcuffs on him to force him to detox. The handcuffs are used on Gadreel when he is captured by Sam and Dean. When Dean confronts the reaper Tessa, and realizes she has carved an Enochian rune in her chest and plans to "blow herself up." He is able to place the handcuffs on her before a fight can ensue between the two. After Castiel has destroyed the angel tablet, Metatron appears in his office and places handcuffs etched with binding sigils on Cas, restraining him in a chair. Dar is shown to be bound with the handcuffs as Sam is torturing her for information. Sam is able to subdue Dean after his fight with Cole, and place him in the handcuffs. Dean is still in the handcuffs when Sam places him in the devil's trap in the Bunker's dungeon. Dean is later able to slip out of the handcuffs, as well as out of the devil's trap, when he becomes human enough. Metatron is hauled out of Heaven's prison in a pair of handcuffs etched with binding sigils. Though he is now human, Metatron is still shackled with the handcuffs. Castiel is immobilized with the handcuffs while he is tortured by the angels Efram and Jonah for information on the location of Metatron. Sam uses the handcuffs on the demon Jervis after he is able to subdue him after infiltrating Needham Asylum. Dean attempts to place Lucifer in the angel cuffs, however Lucifer is easily able to bypass the warding and shrug the handcuffs off. The angel cuffs' sigils glow as Michael is restrained. While forming a plan to capture Lucifer and steal his remaining grace to open a rift to Apocalypse World, Sam states that he believes that in his weakened state, Lucifer could be restrained with the angel cuffs. To keep Lucifer in check, Castiel forces him to wear angel cuffs to keep his power bound. Lucifer agrees, but when the group comes across a contingent of angels, Lucifer smites them with a snap, revealing that the cuffs do not work on him as they melt off his wrists. After Bobby does some tinkering with the angel cuffs, he is able to improve the angel cuffs, allowing for them to hold an archangel, and giving Sam a chance to restrain Michael and bring him to the Bunker.